Coming out on Valentine&apos;s Day 2014 marked the start of a new chapter for actress Ellen Page. And the Juno star&apos;s brave decision to make the announcement at the Human Rights Campaign&apos;s Time to Thrive has earned her not only a great deal of respect in the Hollywood community, but a new accolade: Out Magazine&apos;s Entertainer of the Year. Appearing as one of four cover stars for the magazine&apos;s annual OUT100 double issue, Page talked to the publication about the pressure actors feel to remain closeted in Hollywood. The 27-year old actress admits the years leading up to her public announcement were fraught with anxiety. "I was sad, honestly," she told The Hollywood Reporter earlier this year. "And obviously that&apos;s a very personal thing to say, but I say it to encourage whatever other people are feeling. Very sad, isolated, a lot of anxiety. No more." 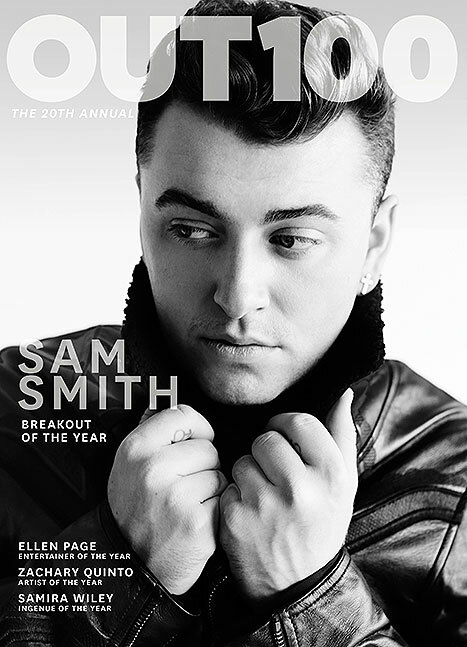 Another performer keen to encourage others that coming out can be a good and positive experience is British musician Sam Smith, also honored as an OUT100 cover star, and named Breakout of the Year. The 22-year-old singer has emerged as one of 2014&apos;s most promising new talents. And as Out Magazine notes, Smith&apos;s sexuality "has become a mere footnote in his journey," something Smith is happy to promote. “My main aim is to tell people how good it’s been for me so that, hopefully, gay men or parents with gay children can look at my story and think, &apos;Wow, that’s how it should be. That’s what we can work towards,&apos;” he told the publication, of living life as a young, gay musician. Other honorees on the OUT100 list include Orange Is the New Black actress Samira Wiley who plays Poussey Washington in the hit series, and actor and producer Zachary Quinto, who was named Artist of the Year.